Feedback – I have few opportunities for requesting feedback, but it is important to me that learner’s comments are gathered together to inform my future practice. Music Librarian – ‘user education’ includes introducing readers to the library catalogue and relevant e-resources as well as encouraging good research and bibliographic skills appropriate to the individual reader’s context and level of study. Musicologist – I give occasional lectures and seminars both within and without the Conservatoire in my capacity as a postdoctoral researcher. Organist/Choir Trainer – the practical, artistic aspect of my profile. Resources – an almost inevitable outcome of my librarian/musicologist existence (not to mention a key focus of my present postdoctoral research) is that I have honed my bibliographic skills to a high level. The Resources page details my professional reading for the duration of the Teaching Artist course, with occasional annotations. Annotated bibliography is an art in itself; for day-to-day purposes, I only annotate occasional entries . One of my main objectives in undertaking the Teaching Artist short course was to equip myself with more knowledge and understanding of good contemporary pedagogy. Starting this blog was part of our digital ‘orientation’, both to facilitate our own reflection and to enable us to share comments with our course-leaders and fellow creative artists. This latter activity thus constitutes peer-review, offering each of us the opportunity to make constructive observations about our colleagues’ practice. As an experienced blogger, reflecting upon various aspects of my work is relatively second-nature to me, but the present subject matter – being a teaching artist and practitioner – was completely new. The 29 posts that I have made include the course assignments (lesson plan, theoretical account, contextual study, theoretical appraisal of my teaching and learning methods, and self-assessment of online discussion), and a few lighter postings when multi-tasking my daily existence threatened to get on top of me; but there are still a good number of postings about my course studies. In general, the blog represents a series of reflections on recommended course readings; and on my own practice. I have sought to reflect upon ways in which the theoretical readings can be applied to my professional teaching practice. (There was a period of adjustment as I realised that my usual third-person, objective research mode of writing needed to be adapted to suit first-person reflection in this new ‘social sciences’ discipline.) I have had opportunity to reflect before, during and after teaching or presenting experiences, and hope to continue in this practice in the months to come, in order to build upon positive and lessen negative outcomes in the future. Another problem that my reflections continually came back to, was the lack of context and continuity in the kind of teaching that I’m required to do. Again, with the abovementioned lesson-plan, I’ve tried to create context by contacting students in advance of the session (see the invitation HERE), and also sought instant feedback at the end of the session. The lesson took place today (19 May 2014), and I intend to follow up with an email to all students and their course-leader a couple of days later, once I’ve transcribed and summarised the feedback forms. Reading about deep, surface and tactical learning was informative, and reinforced my long-held belief that students do not always see the relevance of information skills to their courses in a conservatoire. If learning how to access a particular database or format a bibliography are not directly relevant to, for example, learning the harpsichord, and moreover are not even assessed, then they are reluctant to engage fully – even tactical learning will not take place. I need to continue to work on ways of helping students see the connection between information literacy and academic success, and the major benefits for their future careers whenever information is needed for a programme note or other piece of written work, whether creative or perhaps linked to a business proposal. Indeed, I can draw certain parallels between my information skills teaching and the sessions I have led on the Scottish music BA course. When I’m talking about historical Scottish song collections, my subject matter is at least pertinent to the degree course. However, my research was effectively a combination of musicology and cultural history, whilst student on the Scottish music course are primarily motivated by performing, composing and improvising it. My material is informative, and there certainly is the expectation that these students will have a thorough grounding in the history of their subject, but I have to accept that 18th – 19th century Scottish musical and cultural history may not have as much appeal as a series of gigs or a recording session. Again, I must continue to seek ‘hooks’ to draw them into my historical world, and find ways of demonstrating the relevance of the subject that I am teaching. This is definitely an area that I would like to continue to read and reflect upon, and I should like this to evolve into a more scholarly article in due course. “Having kept a journal for the duration of the course, you are required to summarise your key learning points from the course and post your summary to your ePortfolio. In your summary, highlight what/who has informed your learning and identify any changes you have started to make to your teaching practice. Where changes have been implemented, summarise the impact this is having on your students’ learning experience. Again, in your summary make reference to literature and dialogue with colleagues, peers and your students that are informing your learning and prfessional development . In your summary identify key areas, issues or opportunities you wish to develop following the course. After watching Howard Gardner’s video clip about multiple intelligences, I decided to do the quiz to find out about my own learning styles. Actually, it was both accurate and predictable. 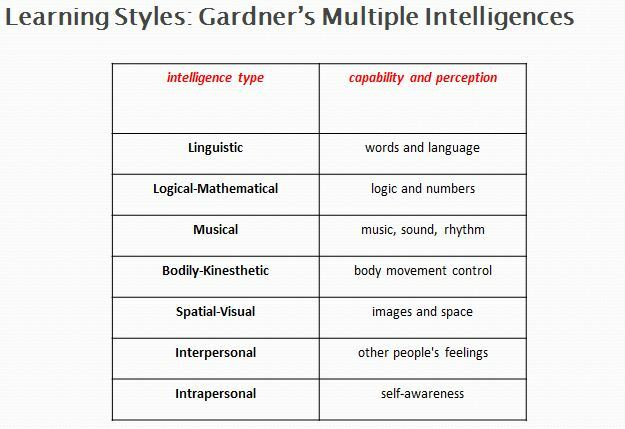 My principle learning style was linguistic, followed by musical and then interpersonal – the typical scholarly type, with a strong dose of music in there too! However, it was certainly interesting to read about other learning styles and intelligences. In the context of the kinds of teaching that I do, I am perhaps a little constrained in the scope of how I could address differing learning styles; school-teachers and teachers of undergraduates might have more opportunities to take these ideas into consideration. Additionally, whilst I fully embrace the aspiration to attempt to vary learning activities so that students with differing intelligences are not disadvantaged, that is easier in the context of broader module or unit design, than within one single computer-based seminar. The question of the formal lecture has occasioned reflective blogposts on several occasions during my Teaching Artist studies. If I am at a conference, then formal lectures are one of the main activities. 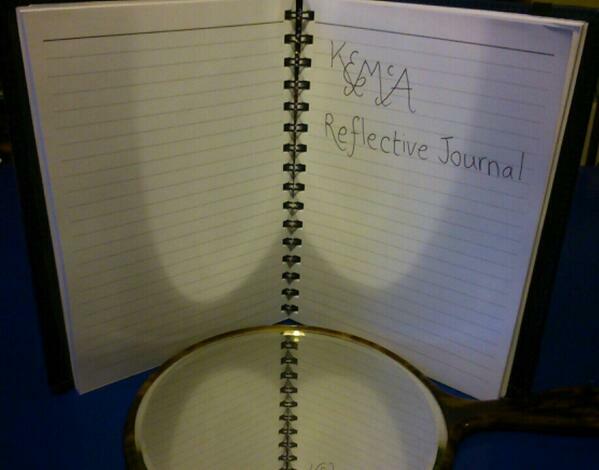 (See my reflective journal posting, ‘The RMA Presentation‘, 17 March 2014). There may be other opportunities for more interactive work, but in a conference lecture presentation, I am not required to ‘teach’ the delegates as I would a class of undergraduates. There will have been no requirement for them to prepare beforehand, nor to provide any form of submission for assessment afterwards. Nonetheless, the more opportunity I have to contextualise my ‘lecture’ – and indeed to query whether it has to be a lecture, or whether there might be opportunities to ‘flip the classroom’ and make the session a more interactive seminar – the better for all concerned. (Khan, 2012) If I can avoid formal lectures and strive to get students more actively involved, then this will be all to the good. I can also email class groups in advance, or have their course leader contact them, to tell them what I’ll be talking about, and perhaps suggest some familiarisation action they might do beforehand. And I can also send follow-up emails urging students to let me know if they’d like to know more about anything we’ve discussed. Such ‘framing’ is a reasonable substitute for the kind of context inherent in a longer series of classes. Contemplating the kind of teaching I’ve done recently or am about to do, it is helpful to draw upon Bloom’s Taxonomy. I blogged about this in my post, More Reading – Bloom’s Taxonomy, 4 April 2014, observing that in something as apparently dry as research or bibliographical skills training, engaging the students’ affective domain first (ie, feelings, emotions and behaviour), might be the best way to bring them to a point of realising that there are advantages in adopting a systematic, and preferably digital approach. I have reflected at length about teaching in the library context, in my blogpost, Contexts for Learning, and Positive Changes, 5 April 2014. If I want singers to learn a choral piece, this is hardly the same as learning an intellectual concept or even a database-searching technique. Working with a group of singers with varying abilities at sight-reading and indeed, music-reading, means that repetition and a degree of learning by rote is wholly appropriate and almost unavoidable. This is a useful list of the nine events of instruction, based on the ‘information processing model’. It is described on our Moodle page as ‘a behaviourist model which also draws from the cognitive approach.’ It seems very logical, though perhaps less interactive than other approaches I’ve been reading about. In my own context, I have difficulty with some of the nine events – not a theoretical difficulty, but a difficulty in their application, as I shall explore herewith. I would instinctively begin by telling a class what I was going to be talking about with them. In a library context, this would tend to be along the lines of, “help you to use the catalogue more effectively so you can find the materials you need for your studies”; “give you an oversight of the many electronic resources available to you here in RCS, and help you decide which might be most useful to you”; or – for my postgraduate researchers, “help you to work out an effective strategy to keep on top of your citations and bibliography,” in the context of the bundle of useful transferable skills that a doctoral student can be expected to acquire. There’s a very useful website called Vitae (realising the potential of researchers), from which I use their Vitae Researcher Development Framework as the broad context for my work. Stimulating recall of prior learning is not quite so easy when you’re giving one-off classes. The best one can do is to prompt contributions from individual students about how they themselves have, for example, kept on top of their bibliographical references – or relate my cautionary tale of the girl who had a great quotation, with no idea where it came from, and see if anyone else has any other ‘dissertation nightmares’ that they’re brave enough to share. As I’ve mentioned earlier today, I am hoping to invite students to come ready to share with their peers any ‘good practice’ of their own, so although I’ll obviously be presenting content (step 4), I am hoping not to stand delivering a monologue. ‘Learning guidance’ (5) in this context will entail demonstrating some key tools. In an hour, I hadn’t envisaged offering hands-on experience (6), which couldn’t be done in much depth. I plan for the session to be more one of shared experience, than a computer-based workshop. As a consequence, Gagne’s events 7 and 8 are not quite applicable to my purposes. Instead of providing feedback and assessing performance, I would prefer to initiate a discussion, summing up some of the conclusions we’d reached, and encouraging students to come and see me individually if they wanted to explore any particular aspect or technique in greater depth. I would then follow up a day or two later with an email asking if the session had been helpful; if there were any points I could clarify or expand upon; or any suggestions for future sessions. This would be how I interpret event 9, since ‘enhance retention and transfer to the job’, whilst desirable, is something I have little control over.